Where did the inspiration to make guitars first come from? Well, I’ll tell ya where it come from: They was from the middle of nowhere and had money power. The first thing they done, they got ‘em a petition. They had a hunnert signers on it. They run it before that I was plum out of hand and I was about to step where I shouldn’t. I was about to get myself into the kind of trouble there wasn’t no gettin’ out of. I lay down there and went to sleep. The Good Lord said, “If you’ll make instruments and give ‘em to the boys and girls I’ll take care of the matter.” I got up from there and went to my shop. That’s the way it went and I only had a hacksaw and a handsaw to start with. My neighbor, he come to me in a few days he looked me over. He said, “Ed what has happened?” I said, “I tell ya what happened.” I told him all about it. We was very close and so he come and he stopped the petition and they just had them a fit, them preachers. Just got all over my neighbor and said, “You hadn’t no business stickin’ your nose into that” and he said, “Well I want to ask you boys: What fault do you find with the blood of Christ?” He said they didn’t want to answer. He said, “You may not want to answer but I’m gonna ask you the question: Is the blood of Christ unclean?” He had ‘em on a spot. The Bible is the only infallible proof we got. All other books you’ll find a little bit of a flaw in. Ain’t one here, the Word of God is pure. If you take Jesus’ word just like it’s written, you’ll never be let down. It’s the Word of Purity. Did you know how to make guitars before you started? No, I didn’t know nothin’ about a guitar. I didn’t find out, I just tried. Well, I tell ya what, I prayed to the Lord. I said “God I want you to help me in this. I’m not able to do it like I’d like to. I want you to help me.” They was a lot of them that went to that man that made all manner of ‘em and said, “That boy is crazy” and he said, “I tell you what,” he said, “You give him a year or two and you’ll find out who’s crazy.” So come on a year or two there was a man over in Berryville that I bought my parts from. So I’s over there one day buyin’ parts and he said, “Have you got one of your guitars with ya today?” I said, “Yeah,” he said, “Go get it.” He had a man and woman in there. I’d never seen ‘em before. So the man take the guitar and sit down and played and him and his wife sang. The man at the store said, “I said you couldn’t take that heavy wood and do it but you’ve done it!” I said, “God can do anything.” God was the only one that helped me because I went everywhere else and they said you cain’t do it. Well that’s the only route that I had out. God didn’t change his word. Whenever He tells you something, that’s it. What sort of troubles did you run into in making the guitars and how did God help guide you to solve those problems? Well, I’ll tell you what problem I run into. Sometimes I’d work for 2 weeks to get one string that I couldn’t get to tune. These strings are smarter than any man that ever walked. They know when they’re not in tune. And there ain’t a man awalkin’ that knows when he’s not. Sometimes it’d be a loose fret, sometimes it’d be somethin’ else but I’d find out what’s wrong and I corrected it. I tried everything I could think of because I was determined because God said if you do this I’ll carry your wife and children through it. What inspired you to install all the metal parts inside your instruments? I was earnestly in it. I was sincere. And whene’er I’d pray to God and He’d show me somethin’ else I’d step into that. These guitars got a different set-up. Your boughten guitar don’t have that rod down the middle of ‘em. On your fifth fret on every one of ‘em there’s a little bitty jingler down into the rod that lets it go free that makes that go right down into the box. Them saw blades got a ring to ‘em. I’d take it step by step. That’s why them sprangs are inside of ‘em. The sprang has got a ring to it. So I’d take them and stretch ‘em. I’d take me a little piece a metal and I’d kinda tap on it and listen at it. I’d say, “There it is!” So then I’d put one on each side on the inside of ‘em. I tried my very best to get ever one of ‘em to harmonize. Yes I did. Because I was in earnest about it. My wife and children was precious to me. That’s why I worked at that like I did. Can you walk me through the process of making a guitar? I started with the body the first thing on all of ‘em. I had a half a barrel. I’d take the boards and I’d boil ‘em and the next morning I’d bend ‘em and wherever where it broke that’s where I stopped and went to work on it. The neck had to have that rod through there to hold it straight because a crooked neck will drain your music. So I put them rods in there. I didn’t at first, I didn’t know what to do. But I knew that God meant business and I was serious too. So I just went right ahead with it. You fasten that neck onto the body the first thing and then you cut you a little trench right down through that neck you know so that rod will fit in it and then you have to make sure that you get that rod the right length. I put the front on first. Then I put the parts in there and the sprangs and then I put the back on it. The next thing was the fret board. After I got the back on it then I’d put the fret board on and then I had to work and get everything just real level the best I could. That there neck had to have a little slope down so the strings would have a little bindin’ on it. I guess you notice that in most all of ‘em. Then 25 inches is what you are from one bridge to the other one. And so you figure that out and that’s where you set your bridge down there where it’s a certain length. And then you see it had another bridge behind that. That nurse she said to me, “Ed that’s the purdiest music behind that bridge!” Then everyone of them frets had to be set exactly right and I had a guitar there that was a boughten guitar and I could go to that and measure and see what that they were. Did you know that the 12th fret goes in the middle of the 25 inches? I ain’t up on that. No. Now I do know that on the 12th fret that there is something different in that because if you take a piece of metal and you put it on that to play ‘em like a steel you come down to that 12th fret and it’ll really show itself. How did you decide who to give your guitars to? I didn’t have to decide. Whenever I started makin’ ‘em the little children would send me their names. It was them, it wasn’t me. When I quit I was 5 behind. I never did catch up. I was in earnest about it. I wanted to do it for the glory of God. It scattered wide. I’ve got so many friends that’ve called me and say, “Ed, your name is just goin’ uphill.” And I said, “Well let me tell you this: my name is the same as it ever was. I’m just the same old farm preacher that I ever was. But God, who solved this, is honoring His holy name and you can’t go too high in honor for Him because the higher you go the more He’ll bless ya.” That’s just the way it works. 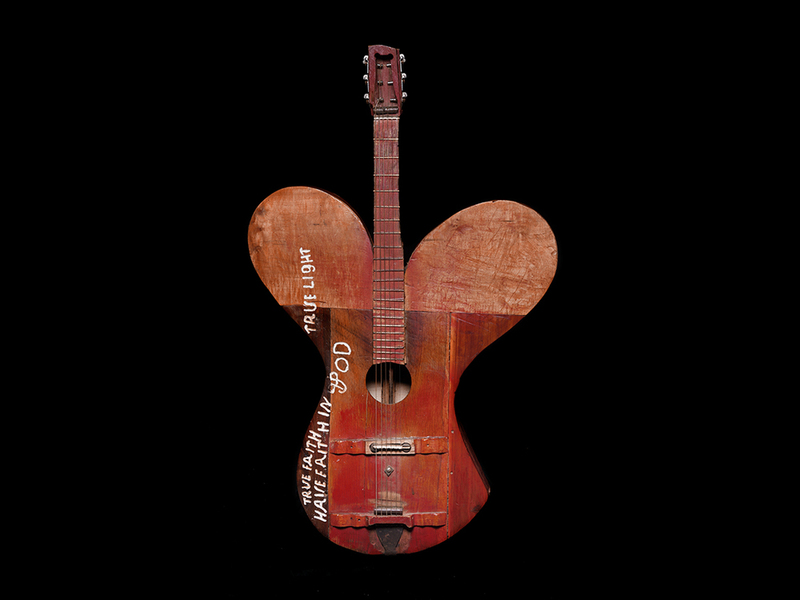 I learned about Ed through photographer Tim Hawley, who has captured these guitars so beautifully in both his images and video. Ed's story and many more images have been honored in True Faith: The Book, available here and also via a kickstarter.